As I have been reading the new book Affinity Online with fellow CLMOOC friends, I have been highlighting some quotes and insights that I find valuable, and sharing some of them out on Twitter. This is a collection from the first two chapters. I do this often as a way to read a bit closer and also to surface some ideas. This collection from the first chapters of the book remind me that many young people find their own affinity spaces because there is not a connection in school or with peers around them, and those places — school, friendship, home — might not understand the passion and connection they find in online spaces. This divided identity is normal for teenagers, of course, but affinity networks can make it even more so (not a bad thing, but something to notice). I also note that the authors remind us that many affinity spaces are always in flux, shifting to meet the needs of new members and new trends in the focus point (knitting, gaming, dancing, etc.) and spaces that don’t adapt and renew will likely fade away. This entry was posted in books, Making Learning Connected MOOC. Bookmark the permalink. 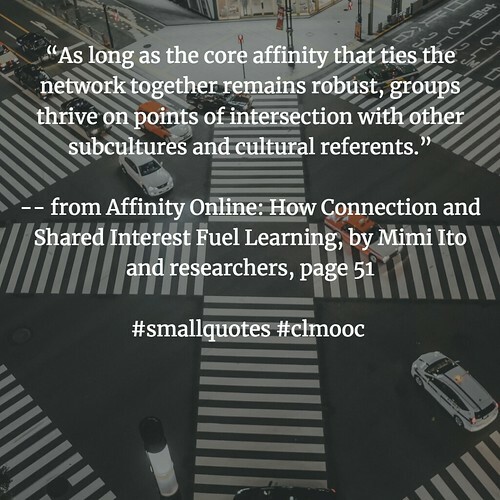 We’re fortunate that the #clmooc hashtag on Twitter acts as a connecting point for the different places were readers of Affinity On-line are sharing their ideas. A Wakalet or some sort of archive should be used to capture all of these posts, and archive them on the clmooc.com site. Maybe in the future that will be a source of learning for some on-line group of students looking to understand how our network operates and to learn from ideas we shared.